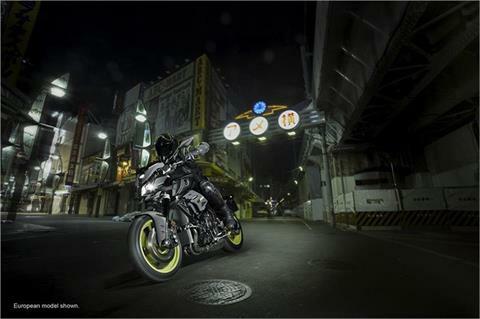 Achieve next level exhilaration around every corner in every gear on the MT-10. REVISED D-MODE MAPPING: 2018 brings refined fuel injection and D-Mode settings. Modes are now numbered, with Mode 1 providing the sharpest throttle response, Mode 2 offering a good all-around character, and Mode 3 offering the smoothest, most progressive throttle response. DELTABOX® ALUMINUM FRAME: The MT-10 uses an aluminum Deltabox frame derived from the YZF-R1 superbike to create a lightweight and responsive chassis built for agility, featuring an ultra-compact 55.1-inch wheelbase. 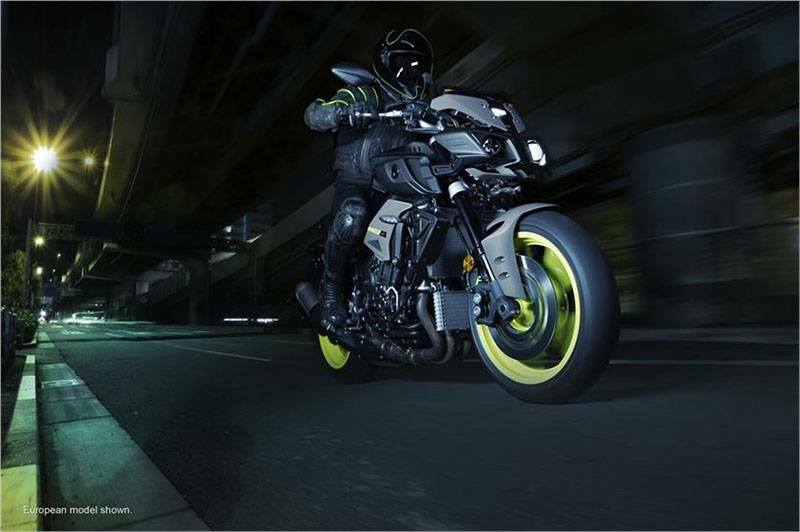 The frame uses a strength-rigidity balance developed especially for the MT-10, and uses the engine as a stressed member of the frame for optimal balance and cornering performance. FULLY-ADJUSTABLE KYB® FORK: The MT-10 features an inverted KYB® front fork with 43mm inner tubes and a 4.7-inch stroke offering full adjustability, for excellent front-end feel and road holding along with a tuning range ready for a wide range of street conditions. POWERFUL, CONTROLLABLE BRAKES WITH ABS: An advanced Anti-lock Braking System (ABS) is mated to high- specification braking components for the excellent braking power and control. Radial-mount, 4-piston front calipers use sintered brake pads to grip a pair of large 320mm discs for exceptional braking power, with a 220mm rear disc brake in support. A compact ABS module provides rapid and accurate brake force modulation to prevent wheel lock-ups. LIGHTWEIGHT WHEELS AND HIGH-PERFORMANCE TIRES: The MT-10 rolls on lightweight 5-spoke aluminum wheels for nimble steering and suspension feel. 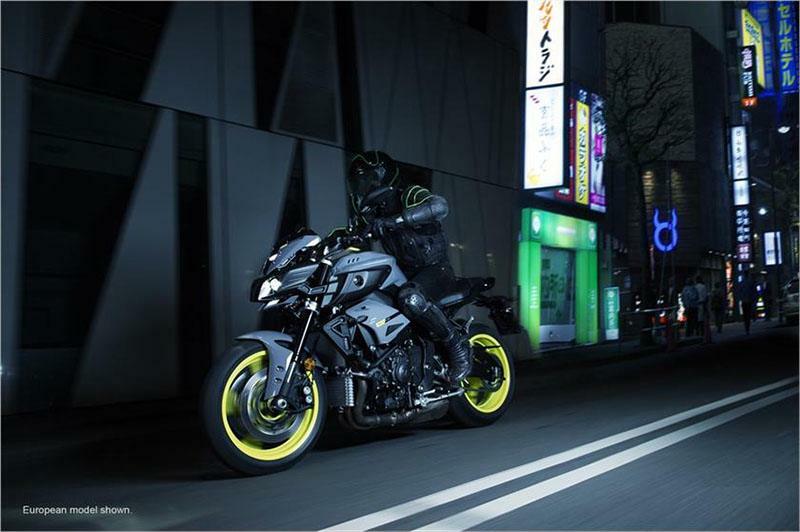 Bridgestone® Hypersport™ S20 tires—a 120/70ZR17 front and a huge 190/55ZR17 at the rear—feature optimized structure engineered specifically for the MT-10, for chassis-matched handling and grip. ADVANCED YAMAHA CHIP CONTROLLED THROTTLE: The ride-by-wire Yamaha Chip Controlled Throttle (YCC-T®) system senses the slightest throttle input by the rider and instantaneously calculates the ideal throttle valve opening, and then actuates the throttle valves to actively control intake volume. 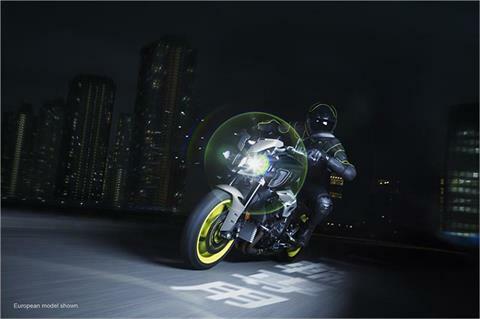 This technology contributes to the rider’s feeling of torque and controllability from the 3-cylinder engine. REVISED D-MODE MAPPING: Thanks to YCC-T, the MT-10 also offers D-Mode, which allows the rider to select a preferred engine response at the flick of a switch. 2018 brings refined fuel injection and D-Mode settings. Modes are now numbered, with Mode 1 providing the sharpest throttle response, Mode 2 offering a good all-around character, and Mode 3 offering the smoothest, most progressive throttle response. R1-DERIVED CROSSPLANE CRANKSHAFT ENGINE: The potent 998cc inline 4-cylinder engine features the same Crossplane Crankshaft technology developed in Yamaha’s renowned YZF-R1 superbike. 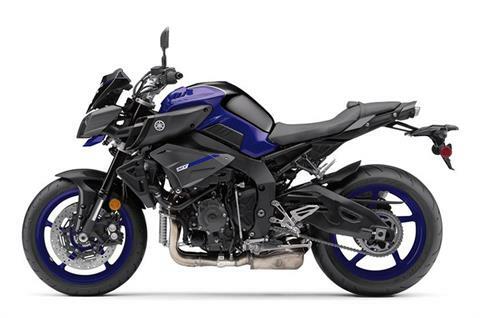 The Crossplane design nearly eliminates inertial engine torque to provide a direct connection between the throttle and rear wheel, for maximum traction and linear torque feeling. Tuned specifically for the needs of the high-performance street rider, the MT-10 engine develops awesome low- and mid-rpm torque with arm-stretching top-end power. 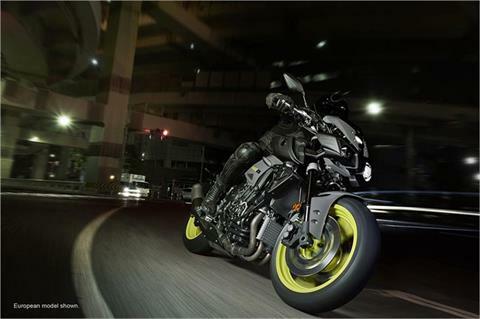 CUTTING-EDGE ENGINE DESIGN: The MT-10 motor features the very latest in engine design to create the ultimate high-performance street sportbike. Engine reliability is ensured with strong, lightweight forged pistons and carburized fracture-split connecting rods moving through an extremely rigid, closed-deck cylinder block. The engine’s cylinders are slightly offset to reduce friction losses, with plated bores for excellent heat dissipation and cylinder sealing. ROCKER-ARM VALVETRAIN: Rocker-arm valve actuation utilizes the lever ratio of each rocker arm to allow for larger valve lifts while using lower camshaft lobes and reduced spring pressure, further boosting power and efficiency. OVERSIZED INTAKE SYSTEM: A huge 12-liter airbox improves rideability, especially when transferring from acceleration to deceleration or vice versa, while 12-hole fuel injectors are angled to optimize combustion chamber filling for improved power and torque characteristics. HIGH-CAPACITY COOLING SYSTEM: A large curved radiator keeps engine heat in check, while a compact air- cooled oil cooler ensures stable oil temperatures in any condition. Simplified pipe and hose routing minimizes the need for additional parts, saving weight. 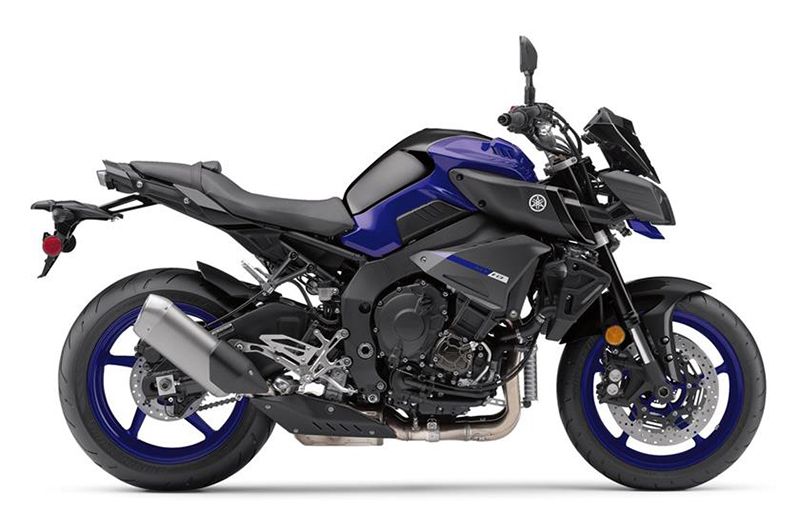 LIGHTWEIGHT EXHAUST SYSTEM: The MT-10‘s exhaust system is manufactured from durable stainless steel with a lightweight titanium muffler. A compact midship exhaust chamber contributes to mass centralization for optimal handling. 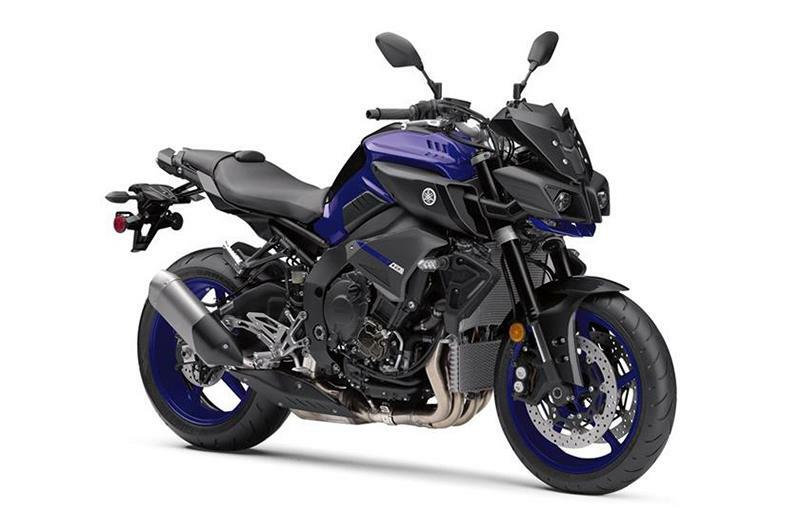 Exhaust flow is regulated by Yamaha’s Exhaust Ultimate Power valve (EXUP®) system to provide optimal exhaust back-pressure across the entire rpm range, further improving efficiency. HIGH-PERFORMANCE LED LIGHTING: In addition to LED turn signals, running lights and taillights, the MT-10 features compact LED headlights for stunning illumination and state-of-the-art style. The mono-focus headlight elements draw very little power but produce a crisp, brilliant beam of light for confidence and visibility in low-light conditions. 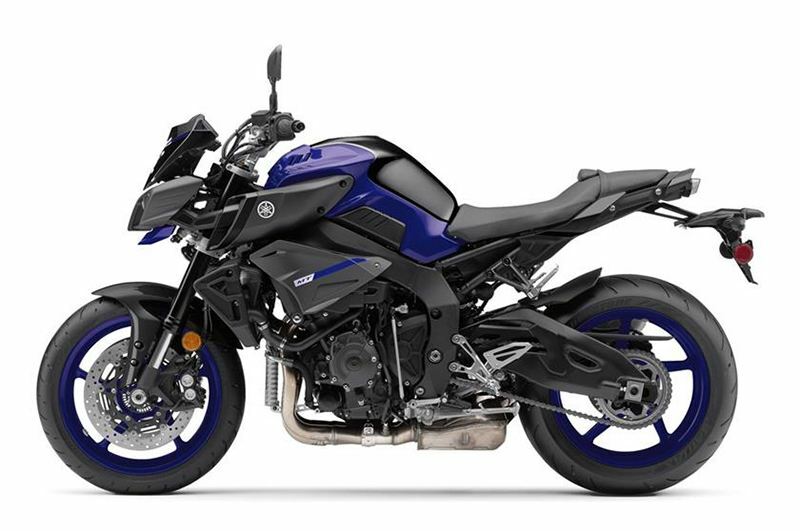 YAMAHA CHIP CONTROLLED THROTTLE WITH D-MODE AND CRUISE CONTROL: The MT-10 features YCC-T®—a ride-by-wire throttle system that provides exceptionally precise engine control—and D-Mode, which allows the rider to select a preferred engine response at the flick of a switch. 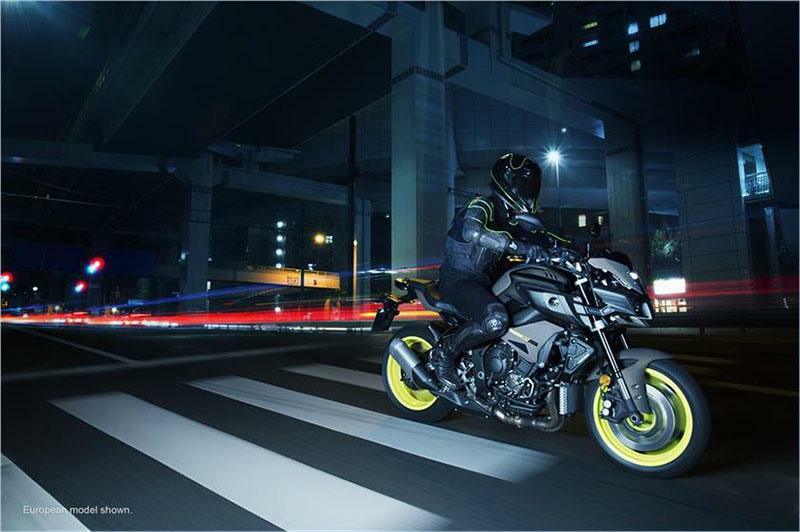 The MT-10 also includes cruise control for improved highway cruising comfort. 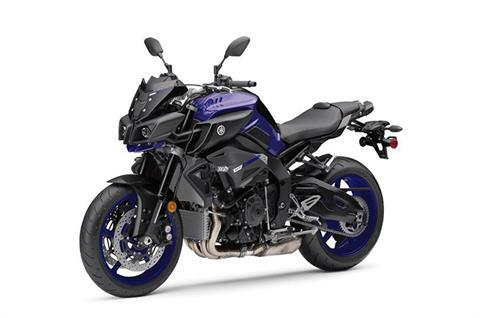 ADJUSTABLE TRACTION CONTROL SYSTEM: An advanced Traction Control System (TCS) assists the rider in managing traction on various road conditions by quickly modulating throttle opening, ignition timing, fuel volume and other parameters. 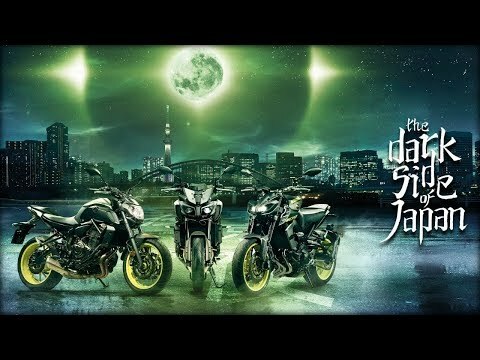 DELTABOX® ALUMINUM FRAME: Like the YZF-R1 superbike, the MT-10 uses an aluminum Deltabox frame to create a lightweight and responsive chassis built for agility, featuring an ultra-compact 55.1-inch wheelbase. FULLY-ADJUSTABLE KYB® SUSPENSION: The MT-10 features a fully-adjustable inverted KYB® front fork and a four-way-adjustable, linkage-type KYB® shock, for excellent road holding along with a tuning range ready for a wide range of street conditions.